Stanley Black & Decker total return outperformed the Dow average for my 52-month test period by 15.25%. The company also has a solidly-growing dividend income. Stanley Black & Decker has increased its dividend 50 years in a row and presently has a yield of 1.8%, which is a little below average. 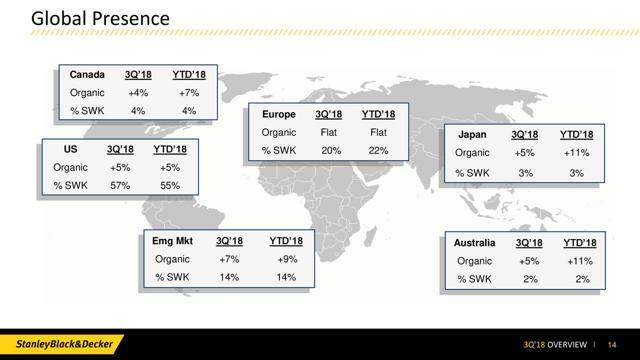 Stanley Black & Decker three-year forward CAGR of 10% will give you good growth with increased earnings from new bolt-on companies and new products. This article is about Stanley Black & Decker (SWK) and why it's a buy for the total return investor who also wants dividend growth income. Stanley Black & Decker is one of the largest hand tools, power tools, and related accessories companies in the world. SWK is an investment for the total return investor who also wants some income, which can grow as the economy grows. When I scanned the five-year chart, Stanley Black & Decker has a good chart going up and to the right in a good steady slope for 2014 thru 2017 and then had a bad 2018 which created a buying opportunity. Fundamentals of Stanley Black & Decker will be reviewed on the following topics below. I use a set of guidelines that I codified over the last few years to review the companies in The Good Business Portfolio (my portfolio) and other companies that I am reviewing. For a complete set of the guidelines, please see my article "The Good Business Portfolio: Update to Guidelines, August 2018". These guidelines provide me with a balanced portfolio of income, defensive, total return and growing companies that hopefully keeps me ahead of the Dow average. Stanley Black & Decker International passes 11 of 11 Good Business Portfolio Guideline, a good score (a good score is 10 or 11). These guidelines are only used to filter companies to be considered in the portfolio. Some of the points brought out by the guidelines are shown below. Stanley Black & Decker does meet my dividend guideline of having dividends increase for 7 of the last ten years and having a minimum of 1% yield, with fifty years of increasing dividends and a 1.8% yield. Stanley Black & Decker is, therefore, a good choice for the dividend income investor. The five-year average payout ratio is low at 41%. After paying the dividend, this leaves cash remaining for increasing the business by buying bolt-on companies and developing new products. I have a capitalization guideline where the capitalization must be greater than $7 Billion. SWK easily passes this guideline. SWK is a large-cap company with a capitalization of $22.0 Billion. Stanley Black & Decker 2019 projected cash flow at $500 Million is good allowing the company to have the means for company growth and increased dividends. I also require the CAGR going forward to be able to cover my yearly expenses and my RMD with a CAGR of 7%. My dividends provide 3.3% of the portfolio as income, and I need 1.9% more for a yearly distribution of 5.2% plus an inflation cushion of 1.8%. The three-year forward CAGR of 10% meets my guideline requirement. This good future growth for Stanley Black & Decker can continue its uptrend benefiting from the continued strong growth in the worldwide economy and housing market. My total return guideline is that total return must be greater than the Dow's total return over my test period. SWK passes this guideline since their total return is 62.40%, more than the Dow's total return of 46.15%. Looking back five years, $10,000 invested five years ago would now be worth over $19,500 today. 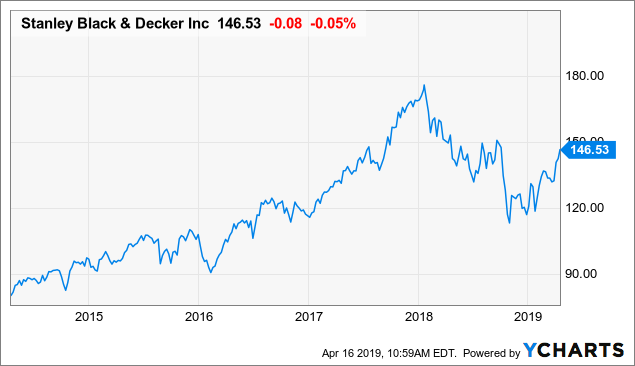 This makes Stanley Black & Decker a good investment for the total return investor looking back, that has future growth as the economy continues to grow. One of my guidelines is that the S&P rating must be three stars or better. SWK's S&P CFRA rating is three stars or hold with a target price of $130, passing the guideline. SWK's price is presently 12% above the target. SWK is over the target price at present and has a low PE of 17, making SWK a fair buy at this entry point if you are a long-term investor that wants good steady increasing dividends and future total return growth you may want to nibble at this company. One of my guidelines is would I buy the whole company if I could. The answer is yes. The total return is strong, and the slightly below average growing dividend makes SWK a good business to own for income and growth. The Good Business Portfolio likes to embrace all kinds of investment styles but concentrates on buying businesses that can be understood, makes a fair profit, invests profits back into the business and also generates a good income stream. Most of all what makes SWK interesting is the potential long-term growth of their business as the working population and economy increases. SWK gives you an increasing dividend for the dividend investor and a good total return. Take advantage of the 2018 dip and buy this good industrial company for a long term investment. The Good Business Portfolio Guidelines are just a screen to start with and not absolute rules. When I look at a company, the total return is a key parameter to see if it fits the objective of the Good Business Portfolio. Stanley Black & Decker passes this total return guideline against the Dow baseline in my 52-month test. I chose the 52 month test period (starting January 1, 2015, and ending to date) because it includes the great year of 2017, and other years that had fair and bad performance. The good total return of 62.40% makes Stanley Black & Decker a superior investment for the total return investor that also wants a steadily increasing income. SWK has a slightly below average dividend yield of 1.8% and has had increases for fifty years with good dividend growth making SWK also a good choice for the dividend investor. The Dividend was increased July 2018 to $0.66/Qtr. from $0.63/ Qtr. or a 4.8% increase. I estimate the dividend will again be increased this year in July 2019 to $0.70 or a 5% increase. For the last quarter on January 22, 2019, Stanley Black & Decker reported earnings that beat expected by $0.01 at $2.11 and compared to last year at $2.18. Total revenue was higher at $3.63 Billion up more than a year ago by 6.48% year over year and beat expected revenue by $17 Million. This was a good report with the bottom line and the top line increasing. The next earnings report will be out late April 2019 and is expected to be $1.1 compared to last year at $1.39 a bit lower but earnings in the second half of the year are expected to be higher than last year. Stanley Black & Decker is one of the largest hand tools, power tools, and related accessories companies in the United States and foreign countries. Stanley Black & Decker is a global provider of hand tools, power tools, and related accessories, mechanical access solutions, such as automatic doors and commercial locking systems, electronic security and monitoring systems, healthcare solutions, engineered fastening systems, and products and services for various industrial applications. The Company's segments include Tools & Storage, Security, and Industrial. Its Tools & Storage segment consists of the Power Tools and Hand Tools, Accessories, and Storage businesses. Its Security segment consists of the Convergent Security Solutions and Mechanical Access Solutions businesses. Its Industrial segment consists of the Engineered Fastening and Infrastructure businesses." 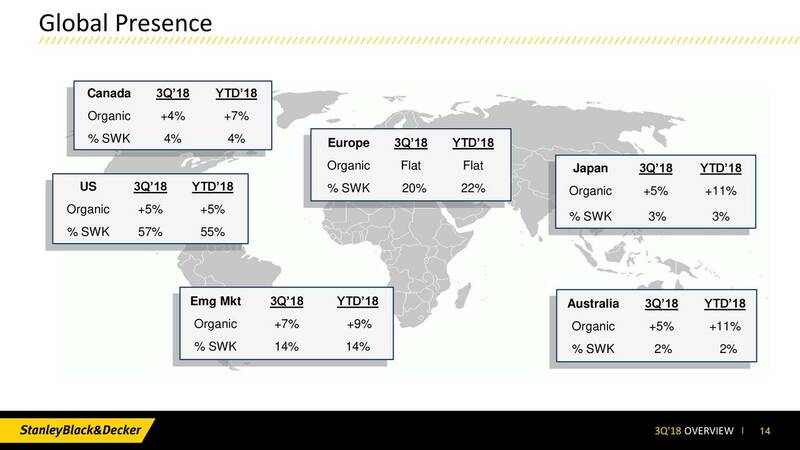 Overall Stanley Black & Decker International is a good business with 10% CAGR projected growth as the United States and foreign economies grow going forward, with the increasing demand for SWK's products. The fair dividend income brings you cash each year as we continue to see further growth as the world economy slowly grows. We delivered a respectable fourth quarter, continuing our trajectory of above-market organic growth and delivering strong EPS growth and solid free cash flow dollars and conversion. As many of you know, in 2018, we faced an unusual and sudden onslaught of large and volatile external headwinds, most of which developed during the course of the year, specifically pressure from input cost inflation, FX and tariffs had, by fourth quarter, grown from our initial January guidance of $150 million pretax to $370 million, which at the EPS level, would have been about 25% dilutive to prior year EPS had we not managed to offset all but $50 million of that with additional price/cost management and other actions. The fact that we ended up delivering 9% adjusted EPS growth in 2018 on 8% revenue growth, which included 5% organic, is quite remarkable. It speaks volumes as to how agile experience - agile our experienced management team deals with short-term adversity and operating environment challenges while continuing to pursue above-market growth and moving the company forward strategically. The fourth quarter revenues were up 5% to $3.6 billion with organic growth of 6%. Tools & Storage delivered 7% organic with strength in all major geographies and business units. The Tools growth was driven by the continued rollout of the Craftsman brand, price realization and leveraging our portfolio of growth catalysts. Industrial delivered 14% total revenue growth inclusive of the Nelson Fastener acquisition, and organic was up 4% for Industrial. The Oil & Gas business exceeded our plan this quarter and delivered a robust 27% organic growth derived from increased pipeline project activity in North America. Security was a bright spot this quarter, delivering both operating margin dollar and rate improvement versus a year ago. The Security team is energized and focused, and we are looking forward to realizing a significant and growing benefit from that business' transformation as 2019 unfolds. EPS for the quarter was $2.11, in line with expectations." The graphic below sums up the global reach of SWK. This shows the feelings of top management for the continued growth of the Stanley Black & Decker business and shareholder return with an increase in future growth. SWK has good growth and will continue as the foreign economies grow and demand for industrial and commercial products increase. Stanley Black & Decker is a good investment choice for the total return investor with its slightly below average dividend yield, fifty years of dividend increases and high total return. Stanley Black & Decker will definitely be the next buy when a slot opens up in The Good Business Portfolio. I have decided that HP Inc. (HPQ) forward growth does not look good and am in the process of selling this position. If you want a growing dividend income and good total return in the industrial business SWK may be the right investment for you. On March 12 the portfolio closed out the position of Arconic (ARNC) , I only have one more commodity play Freeport McMoRan (FCX) that I think will go up over time. On February 2 increased position of Realty Income Corp. to 0.7% of the portfolio, I could use a bit more steady monthly income. On January 30 increased the position of Simulations Plus from 0.2% of the portfolio to 0.4%. I think their product may be the product of the future for drug testing. The Good Business Portfolio trims a position when it gets above 8% of the portfolio. The five top percentage of the portfolio companies in the portfolio are, Johnson & Johnson (JNJ) is 8.3% of the portfolio, Eaton Vance Enhanced Equity Income Fund II (EOS) is 8.0% of the portfolio, Home Depot (HD) is 9.1% of the portfolio, Omega Health Investors (OHI) 8.1% of the portfolio and Boeing (BA) is 13.8% of the portfolio. Therefore BA, EOS, JNJ, OHI, and Home Depot are now in trim position, but I am letting them run a bit since they are great companies. Boeing is going to be pressed to 15% of the portfolio because of it being cash positive on 787 deferred plane costs at $316 Million in the first quarter of 2017, an increase from the fourth quarter. The first quarter earnings for 2018 were unbelievable at $3.64 compared too expected at $2.64. Farnborough Air Show sales in dollar value just beat out Air-Bus by about $6 Billion, and both companies had a great number of orders. Boeing received an order for 18 more KC-46A planes. The second quarter 2018 earnings beat expectations by $0.06 at $3.33, but a good report was hurt by a write off expense on the KC-46 which has started delivery in 2019. Two KC-46A tankers were delivered in January 2019. As a result of the good fourth-quarter earnings, S&P CFRA raised the one-year price target to $500 for a possible 20% upside potential. Boeing has dropped in the last 4 weeks because of the second 737 Max-8 crash, and I look at this as an opportunity to buy BA at a reasonable price. This is just my opinion.